Extend your children’s play spaces and casual living areas by adding a beautiful deck designed and built by Outside Concepts Eastern SA. 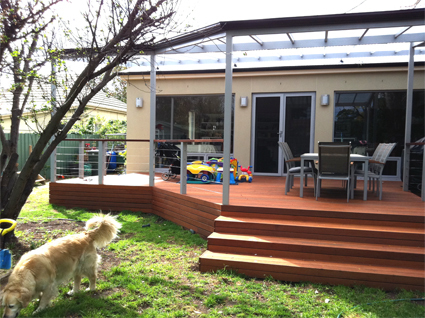 Recently completed in Dulwich, South Australia, this spacious deck is built using the best quality materials; Kapur hardwood decking, Palram SunPal multi polycarbonate roof sheets and Capral anodised aluminium roof beams and posts. The balustrade features the popular stainless steel wiring system by Miami Stainless topped with a Merbau hardwood handrail. 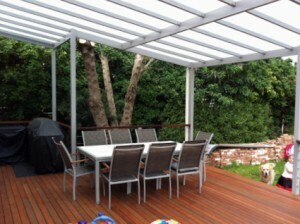 In addition to high quality materials and great craftsmanship, this Dulwich deck is packed with great design features. The twin-wall roof sheeting reduces heat to your deck while providing ample filtered light – a great choice when your deck is used throughout the day. Children can play happily; the dog snooze and your cup of tea can sit comfortably on the Merbau handrail while you supervise proceedings in the backyard! The awning is attached to the house using Extenda brackets – a unique roofing system that anchors the awning back into the existing house frame allowing a raised roof pitch. Lifting the roof slightly higher than the house roof allows more light and extra air to circulate through the decked area while increasing visual appeal and minimising any darkening of interior spaces. Deep wide steps open the deck into the yard providing generous access for busy families. Being fully-framed and enclosed, the steps are safe and easy to negotiate even for small children and provide great casual seating for activities like throwing the ball to the dog! 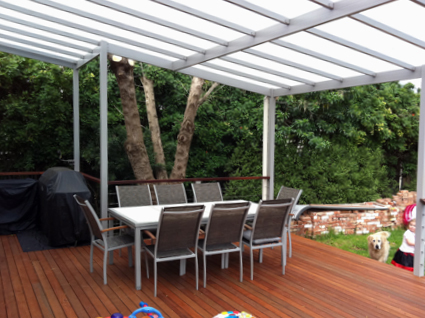 Teamed with a BBQ and casual dining setting your children will quickly adopt your new deck as their play space and spend the holidays outdoors and undercover! Call Outside Concepts Eastern SA for a free on-site quote today!